While not all stump removal companies or full service tree companies do a utility locate prior to service, we feel (and are obligated under Colorado law) to arrange for a locate prior to service. In addition to the obvious safety concerns, a utility locate protects you the property owner and allows our insurance company to stand behind us. We generally need 3-4 days lead time to allow for the locate services to be completed. The additional administrative time & paper work is included in our minimum charge. The second pass cuts the remaining roots & stump along with surrounding dirt and is repacked into the hole to leave the ground approximately level or raised an inch or two. This is the most fluffy the ground will be and settling is expected but should end up close to the original grade level. If you are wondering what exactly happens with stump removal, here is a time lapse video of removal of a medium sized (2′x3′) pine stump. 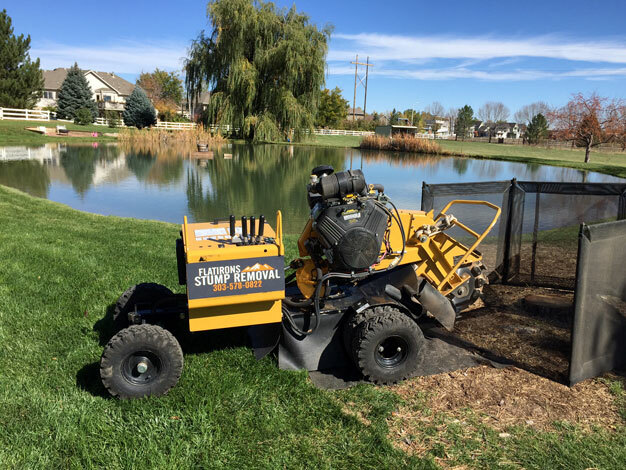 Flatirons uses one of the smallest and lightest (yet most efficient) stump grinders in the Denver area resulting in the least impact on surrounding landscape, less run-time and less CO2 emissions. This is especially important when traversing lawns recently watered or after rain. Our machine will also fit through a standard 36″ yard gate for access to backyards. Noise: our machine is about as loud as a commercial lawn mower, but quieter than most motorcycles. Weight/turf impact: our machine has about the same impact as a golf cart driving across a lawn. Flatirons provides a one page written Service Agreement which includes scope of service, specifications and terms before we get started. Stump removal is a battle of physics & fossil fuels vs. years of organic growth, and the point of contact is a violent place. Flatirons is one of the only stump service companies in the Denver area that deploys steel-framed heavy duty mesh safety screens to contain flying debris. In addition to protecting your property, these screens serve to contain the mulch and wood chips produced from the destruction of the stump, reducing required clean-up time, allowing us to keep our prices low.